There are certain feelings and states which come to us that are difficult to explain; it starts with a pinhole burst of sunlight piercing the into the confines of a darkened heart, a man will suddenly feel invincible. Able to do things he once found burdensome, tiring and lethargic a dramatic change to the miserable mood which was dominating his week. Only that, as soon as this feeling comes to him the demoralising and brooding cloud of pessimism takes hold of him once again like the great depression. Why and how are these interchanging feelings so powerfully charged it can make a man on the hight of his success suddenly change and begin a downward spiral into a self-pitying destructive drink and drugs abuse. Or, be the driving force to lift a man out of his slumber, make him become sober and begin a quick recovery into the self-control and ambitious life he always dreamed of. 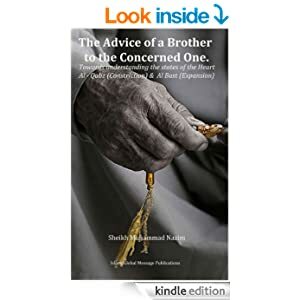 The book, The Advice of a Brother to the Concerned One: Understanding the Spiritual States of the Heart; Constriction [Al Qabz] & Expansion [Al Bast] seeks to touch on the sensitivities of human emotions, trauma, psychological exploits of addiction and the enduring myth man is in complete control of his life to do as he wills. Delving into the harmful effects of spiritual denial of the human body, its spiritual need and the need for balance between the physical and the spiritual . Written in the fashion of classical Sufi books, words leap out of the book and directly appeal to the conscience of the reader; a father speaking to a long distance son, a brother giving advice to a farewell friend, a teacher’s last advice to his student. The format of the book is popular among the masters of purification and Sufism. Imam Al Ghazali, Shaykh Abdul Qadri Jilani are a few of the front runners who use this format in books like the Ihya and the secrets of secrets to directly speak to the reader and transcend the centuries of gap between the reader and the author making the teachings relevant any era. Readers who are familiar with Sufi masters books, will no doubt find this book, The Advice of a Brother to the Concerned One: Understanding the Spiritual States of the Heart; Constriction [Al Qabz] & Expansion [Al Bast] assuring in its conformity to classic books. “Depression, stress and states of negativity in general are experienced by almost every human on earth. But, what are the causes which bring about these undesirable states? Why do people feel the way they do? Sometimes these states drastically effects a person’s faith in God and even the morals of life. This book endeavours to draw conclusions and lessons from religious scriptures on why man feels the way he does; How to have a positive life experience and bring about pleasure and satisfaction in almost all situations. It delves in deeper into philosophical concepts to try and answer the question of ‘free will and freedom to express. Questioning are we really in control of our lives as we would like to believe? Or, is there something that binds us together and causes us to feel the states we do. These lessons in this book are taken from Islamic Sufi teachings and coupled together with self-help tips, this book ensures it will be a good read for anyone seeking to improve his or her life”.